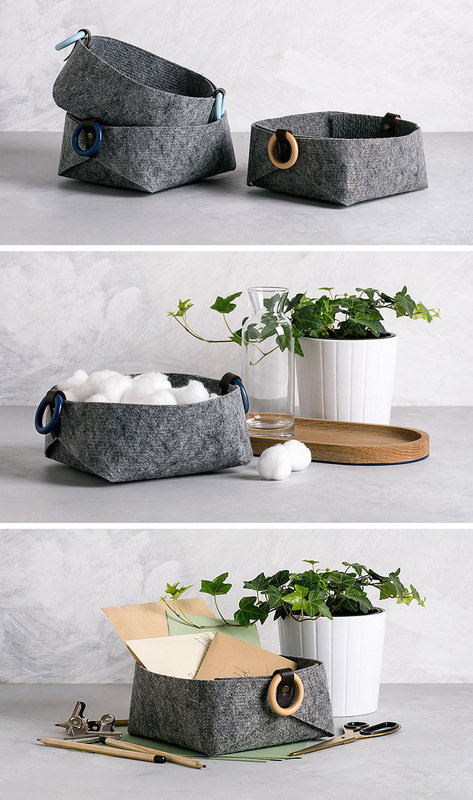 Elisheva Manekin of Loop Design Studio, has created a line of felt storage baskets that are minimal and versatile. Using industrial grade felt, brass snaps, and wood handles, these modern storage baskets are designed to be strong. These modern baskets are cut from a single piece of felt and shipped flat, with the snaps pre-attached to make assembly easier. This means that once they’re fully assembled, the baskets are extremely sturdy and secure. The sturdy form of the baskets means they can hold anything and everything from books and magazines, to blocks and toys. While the large baskets are good for holding bigger objects, the smaller ones can be used more like catch-alls at the front door, or as small storage vessels in the bedroom.